Dubbed the world's "Largest Permanent Light and Sound Show" by Guinness World Records, A Symphony of Lights is a spectacular light and laser show synchronized with music blasting from speakers strategically located on the waterfront. Participating buildings from both sides of Victoria Harbour provide the moving lights for a dazzling, mesmerizing visual delight illuminating the harbour followed by rising colours turning the already picturesque harbour into kaleidoscopic spectacle. Tutubi, who waited at Tsim Sha Shui harbourfront near Statue Square, wasn't able to capture the true essence of the symphony due to a mistake when he setup his camera on a tripod aimed at the wrong side of Central and Wan Chai districts of Hong Kong Island. He also had to pack up his camera earlier due to an imminent drizzle. The sky was cloudy still with the mountain and lights of houses that looks like flickering stars on Hong Kong Island and Victoria's Peak obscured by fog. For sure, Tutubi will be back to capture the captivating symphony in the future for a postcard-perfect photo of the famous skyline. Bring tripod, best vantage point is at the harbourfront between Statue Square (where Bruce Lee's statue and those of Hong Kong's cinematic heroes are) and Hong Kong Cultural Centre in Tsim Sha Tsui of you want to view the Hong Kong Island show. Be at the vantage point at least an hour earlier to avoid "boxing out" for the best position for picture taking or an unobstructed view. Aim for a good spot between the IFC and Bank of China Tower for perfect photos. 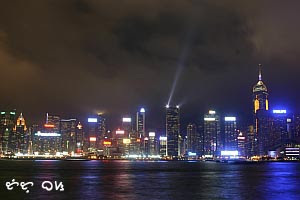 You may also book a night cruise via Star Ferry Harbour Tour. I want to go there. I have thought it would be cool to go shopping there! Copywriter; that sounds cute. Anyway, it was interesting information. The first picture is nice, imo. symphony of lights is one of those things i love about HK. great way to roam around with my tourist friends.. accessible and most of all FREE! you can also have a good view up on the viewing deck. stairs near the clock tower. I happen to see twice yang symphony of lights kaso nga lang sobra yung fog/smog kaya di masyado makita yung mga buildings across the harbor. Nice pictures! 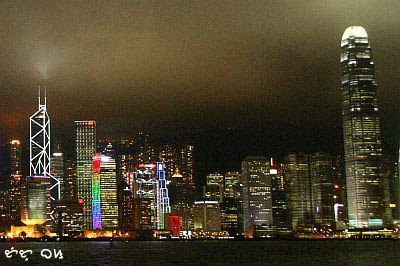 I got nice pics from the show too.. too bad you didn't capture the streak of lights in the sky coming from bank of china, its the best. hello. is it free to watch? Nice photos and great description of the place. I wanna go but it's not just too easy if you're on a full-time office setting wherein you can't just take a few days leave anytime you want. if i would take the duk ling night tour, would i be able to see the show? thanks!